The incredible story of Philadelphia Eagles’ backup quarterback Nick Foles will be told even when the memories of the improbable Eagles Super Bowl win have faded. The seventh-year signal-caller, who was initially selected in the third round of the 2012 NFL draft, very famously ended the 2013 season with the third-highest passer rating and the best touchdown-to-interception ratio in NFL history, while he also led the league with 9.1 yards per attempt. Foles then managed just 546 snaps before a broken collarbone ended his 2014 season, and he then spent time – both as a starter and as a backup – with the St. Louis Rams and Kansas City Chiefs before he re-signed with the Eagles before their 2017 campaign. To say the rest is history would be an understatement. After the season-ending knee injury to then-MVP-candidate Carson Wentz, Foles made a return to Lincoln Financial Field in Week 15 of the 2017 season. He didn’t fare too well; he finished up the season with a 45.9 overall grade (34th among 39 qualifying quarterbacks in that span) and threw almost as many turnover-worthy passes (5) as big-time throws (7). Despite his relatively poor play, the Eagles still managed to win two of those three games, and they sailed into the postseason as the No. 1 seed in the NFC, setting the scene for one of the best playoff runs of all time. Over the course of the 2017 postseason, which included games in the Divisional Round, the Conference Championship and the Super Bowl, Foles completed 77-of-109 attempts for 971 yards, six touchdowns and one interception, which generated a passer rating of 115.7 – the fourth-best mark ever recorded by a quarterback in a postseason within the PFF era (2006-present). In that span, Foles tallied a big-time throw percentage of 6.6%, which is the ninth-best single-season mark ever recorded by a quarterback in the postseason, but as great as that was, it was his ability to limit his turnover-worthy plays which ultimately gave his team their shot at their very first Super Bowl title. Through three games and 106 pass attempts, Foles logged just one turnover-worthy pass, and his resulting turnover-worthy play percentage of 0.9% is still good for the third-best mark ever recorded by a quarterback in a single postseason. All told, Foles ended the 2017 postseason with a Super Bowl title, a Super Bowl MVP award and the fourth-best postseason passing grade in PFF history (90.1) next to his name. It was an unlikely outcome and a truly feel-good story, but it couldn’t possibly happen again, could it? Well, fast forward almost a year later and the postseason legend of Nick Foles showed no signs of slowing down against the league’s best secondary in his team’s victory against the Chicago Bears on Wild Card Weekend. Just like last year, Foles was forced into the starting lineup to replace the injured Carson Wentz in Week 15, but unlike last year, he played relatively well. In his team’s final three regular season games, Foles led the league’s quarterbacks with an average of 8.5 yards per attempt, while his 109.6 passer rating from a clean pocket and his 80.4 overall grade were good for 11th and seventh among quarterbacks in that span, respectively. Foles then carried his regular season form into his team’s first playoff game of the 2018 season, and he was mostly unfazed by the league’s best defense. The former Arizona quarterback went 25-of-40 for 266 yards, two touchdowns and two interceptions, with one of those interceptions being the result of a great defensive play rather than a poor throw. 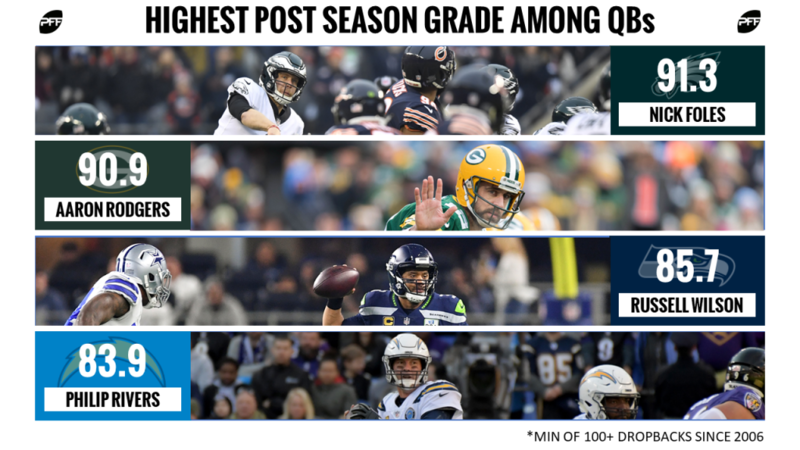 He orchestrated a game-winning drive at the end of the game, going 8-of-15 for 73 yards and a touchdown in the fourth quarter, and consequently ended the game with an overall grade of 79.0 – the fourth-best mark among quarterbacks on Wild Card Weekend. Foles’ latest installment of postseason excellence contributed to his career postseason grade, which now stands at 91.3 – the best mark among all quarterbacks in the PFF era with at least 100 dropbacks in the postseason; better than Aaron Rodgers (90.9), better than Russell Wilson (85.7) and better than Philip Rivers (83.9). It marks the incredible journey of Nick Foles in the playoffs, who has now graded above 75.0 in four of his five playoff games as a pro. For his career, Foles has been nothing short of miraculous in January and beyond, completing 125 of his 179 attempts for 1432 yards, 10 touchdowns and just three interceptions. He’s thrown nine big-time throws and had just two turnover-worthy plays, his 8.0 yards per attempt is the fifth-best career mark by a postseason quarterback in the PFF era, his 105.2 passer rating comes in second to Hall of Fame signal-caller Kurt Warner and his 77.3% adjusted completion percentage tops the list that also contains Drew Brees (74.1%), Peyton Manning (70.3%) and Tom Brady (71.6%). Foles’ performance from a clean pocket, the most stable situation to assess and predict quarterback performance, has been good for the most part. When he’s been kept free from pressure, he’s completed 99-of-130 attempts for 1101 yards, five touchdowns and just two interceptions, and his resulting passer rating of 107.2 ranks fourth among quarterbacks with at least 100 dropbacks from a clean pocket. However, the most impressive aspect of his play from a clean pocket is the fact that he’s the only quarterback in that group who doesn’t have a single turnover-worthy pass to his name. 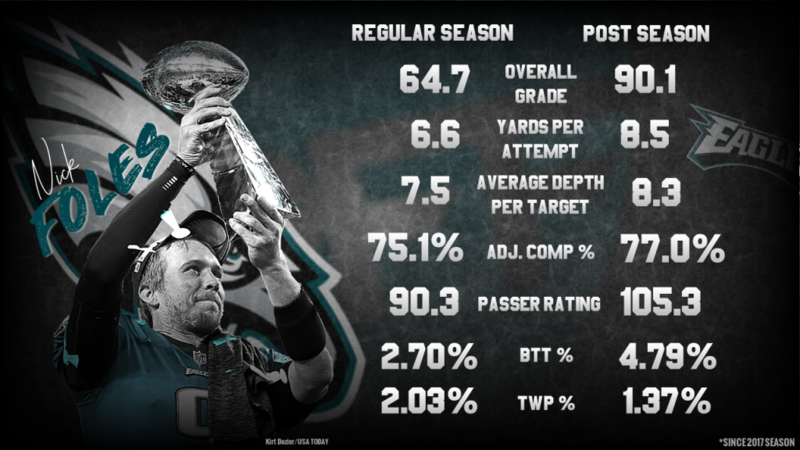 While it may not be as stable, performance while under defensive pressure is still a vital aspect of quarterback performance, and it’s here where Foles has exceeded in his postseason endeavors. Throughout his career, Foles has completed 26-of-49 attempts while he’s been under duress for 331 yards, five touchdowns and just one interception. His completion percentage 53.1% ranks third among quarterbacks with at least 25 attempts, as does his adjusted completion percentage of 65.0% and his average depth of target of 13.3 yards. However, his passer rating of 100.0 is the best mark among postseason quarterbacks in the PFF era and is 11.5 points better than the next closest player at the position. Over the last two postseasons, the Eagles and their backup quarterback have defeated the Falcons, the Vikings, Tom Brady and the Patriots in Super Bowl LII and now the league’s best defense in the Chicago Bears. Is it really that crazy to think that the Eagles and their backup quarterback – the highest-graded postseason quarterback in PFF history – can go toe-to-toe with Drew Brees and the New Orleans Saints?